Alien: Isolation was just the beginning for Amanda Ripley. Following the surprise announcement of the Alien: Blackout mobile game in January, it looks like Amanda's continuing story will also be told via another medium: an animated series. 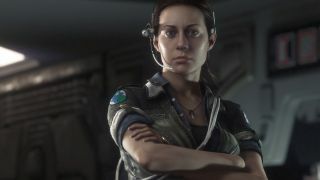 According to an Observer report, a seven-episode show is currently in development by Axis Animation, the studio that created all the CG cutscenes for Alien: Isolation. It makes sense that a show following Amanda's fight against the xenomorphs stalking around space would be in the works, completing the "Read. Play. Watch." trifecta that's been repeatedly teased by the Alien brand for 2019. Alien: Blackout fits the 'Play' part (it's even highlighted in green for the reveal trailer! ), and 'Read' likely refers to the new Aliens: Resistance comic from Dark Horse, where Amanda teams up with ex-Colonial Marine Zula Hendricks to take down the insidious machinations of the Weyland-Yutani Corporation's cover-up. That just leaves the 'Watch' bit, which would fit for a show that Observer theorizes would live on the official Alien website. It's still unknown if the animated series will take place immediately after the cliffhanger ending of Alien: Isolation. Perhaps it would condense and retell the events of Isolation - after all, the survival horror game made its debut back in 2014, which is practically ancient in media years. Axis Animation sounds like the perfect fit for the show, and the studio has a large body of work related to gaming. Its credits include high-quality cutscenes for Destiny 2, League of Legends, The Elder Scrolls Online, Heroes of the Storm, Horizon Zero Dawn, and many more. Between the new game, comic, and an animated series, the folks behind the Alien franchise want to be damn sure that by the end of 2019, you know exactly who Amanda Ripley is and what she's had to struggle through. There's been no official confirmation for this show as of yet, but we'll likely get an announcement in the coming months. Alien: Isolation has a dedicated fanbase for a reason - it's one of the best horror games of all time.